Ok, renovation is a harsh word. I will give you that. However, it feels like we are doing a full-blown demo on our bedroom. We are literally changing everything. 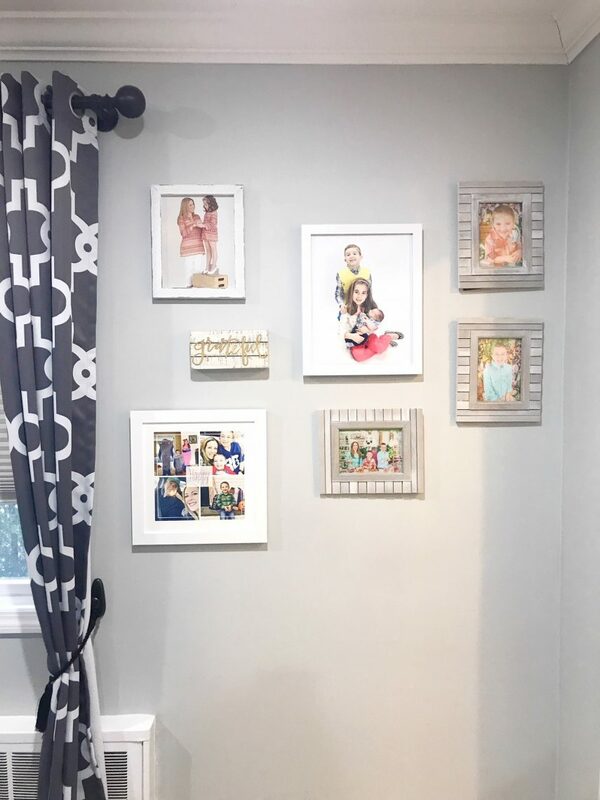 From the paint color to every single piece of furniture in the room to all wall decor. It’s like starting from scratch! And we have a deadline! Last year, Johnsons Baby gifted me a family photo shoot for Christmas. How wonderful, right?! Well, my scheduled appointment is this SATURDAY! The photographer wants to take some photos of us all hanging out on the bed while watching a movie because that’ s something we normally do. I need my bedroom DONE BY THEN OH MY GOODNESS. So – what have I been working on? This side project is in complete full swing this week. I bought several white picture frames and hung them up all around one of my walls. I even included a cute grateful sign in the mix. Truthfully, this area isn’t done yet. I want a very thin piece to sit at the bottom of the wall. I just think it needs to get filled up a bit more, right? I’m off to hunt this afternoon. 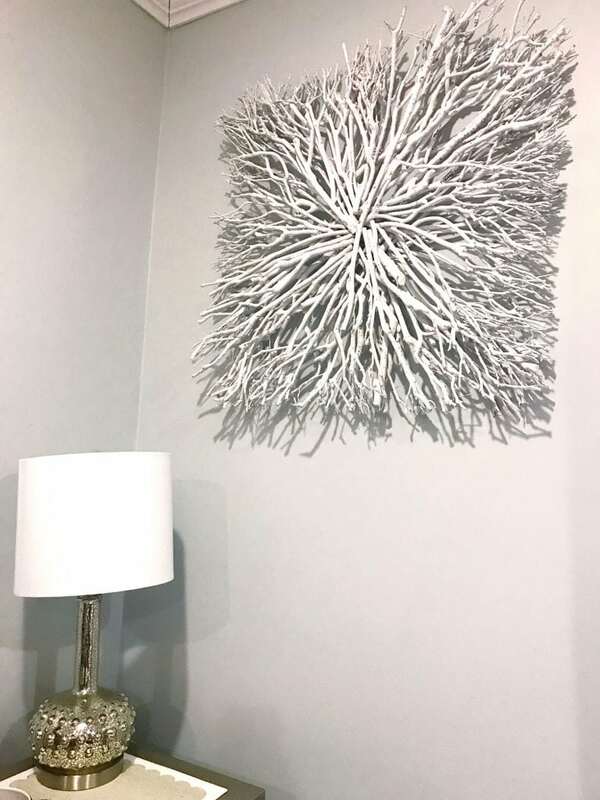 Right next to my bed, I opted for this white branch 3D box wall art. Sadly, I don’t have a link for this one – or anything remotely like it! 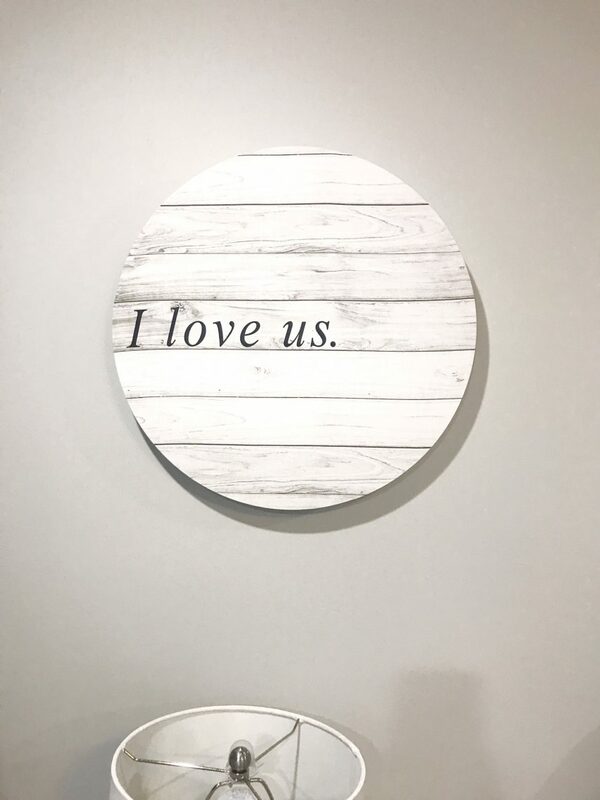 I bought it at Home Goods and cannot find a replica online. Prior to the design change, I had multiple paintings of trees hung up in the bedroom. From every season. I absolutely love trees. I believe they have souls – some are dancing, some are listening, some are waiting. I find them mesmerizing!! But all of the frames I previously owned were too dark. So, we had to transfer them to our archive. AKA the basement. I thought this simple piece would be able to represent the ones we removed. And even more so because it’s not quite a painting, is it? I love that this wall art is actually made up of branches. It’s like I brought in a little bit of what I love right into the home. The lamps were also a major score! They are J. Hunt and Company (similar from brand here and here) and also from Home Goods. I thought the silver and bluish grey would be a fun theme to work with and these lamps fit right in! I can’t wait to show you the final product!